If you are not 100% satisfied contact us to return your product and we will offer a full refund or exchange! STURDY AND MORDERN LOOKING-Stylish silver hooks, beautiful and fashionable, compatible with any other modern designed home decor.Rust and corrosion resistant for your bedroom, bathroom, kitchen and office.Save space and keep it clean. Best for jackets,coat,necklaces,bathrobes,bath towels,loofahs,bag, hats, scarves, keys, purses,soup ladles, spatula, dog leash,soap scrubs. WIDELY APPLICATION- Stylish, Functional and Modern Design, stainless steel finish ensuring durability and dependability, designed to hold a wide variety of items, ideal for foyers, hallways, bathrooms, kitchen, bedrooms, closets, living room, toilet, office, showrooms, supermarkets, etc.Save your spacce and keep your room tidy and clean. 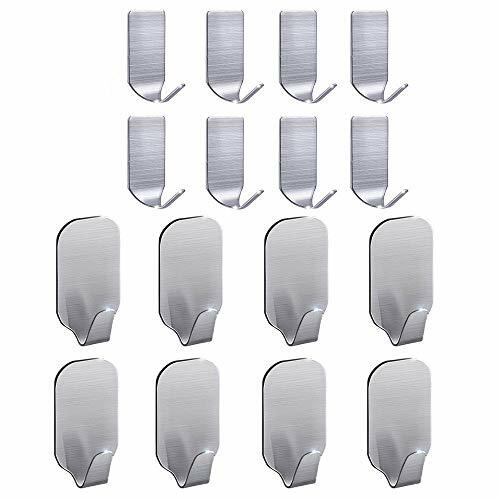 Yomiokla Bathroom Accessories - Kitchen, Toilet, Balcony and Bathroom Metal Towel Ring Stainless Steel Punch-free towel racks wall mount Shelf 60 cm (work-shaped hole).